My wife’s restaurant of choice almost always ends up being Italian. But who can turn down fresh pasta, homemade sauces and amazing delicacies like Nonna used to make. In preparation for our trip to Montréal for our anniversary, we browsed many online menus and took an interest in Ristorante Beatrice. Located in Montréal’s Golden Square Mile, the restaurant features a terrace with a lavish garden in the heart of the city. We checked our coats at the door and there was a large event taking place. We walked through the second door where we were greeted by the hostess who kindly led us to our table. We were surrounded by greenery. A large open concept space with a bar at the back and big windows in the front overlooking Sherbrooke Street West. Our server came to greet us, his name was Carlos, he was very nice and presented himself well. We asked to have some time with the menu and he let us know that an amuse bouche would be arriving shortly. Another server came by and dropped off our Air Transat sponsored amuse bouche. A single arancini atop a spoonful of tomato puree. I’m a big fan of arancini, this one featured a mushroom risotto with a piece of mozzarella inside, in a crisp breaded exterior. The problem here was that the inside was cold and the mozzarella was hard. We advised Carlos who quickly removed the plates. He returned promptly advising us that he would be back shortly with more. He also noted that he told the kitchen so that they can ensure this doesn’t happen to anyone else. That right there is caring service. He went above and beyond our issue to prevent more. I liked that. We completed our order of appetizers and mains. The dining room was very busy with groups of all kinds from families with small children, to couples. To start we ordered the Polipo and the Insalata Alla Cesare. Polipo featured grilled octopus, peperonata and salsa verde. 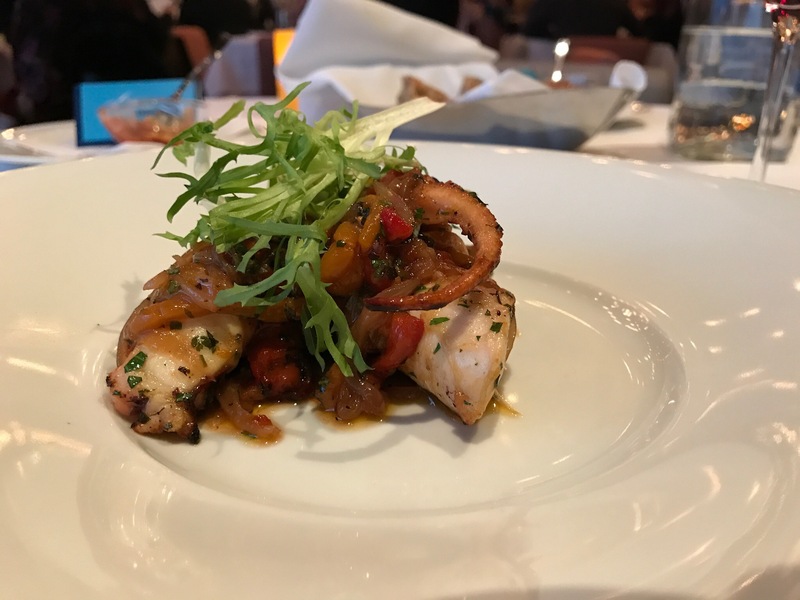 The octopus was cooked to perfection, tender and the peppers, onions, tomatoes and salsa verde kicked it up a notch. Insalata Alla Cesare was a classic with a twist featuring brie cheese and crispy prosciutto. It was different but good. We would order it again. We were quite pleased with our appetizers and anxious for our mains. What was on the docket you ask – Fettuccini and Gnocchi. Fettuccini like no other, fresh squid ink pasta, nduja, sea scallops, shrimps and squid in a cream sauce. The seafood was cooked to perfection and the sauce boasting flavours of butter and heavy cream. It was lavish! Gnocchi was made of ricotta and was served with a broccoli pesto with pistachios. The gnocchi was light and perfectly handmade. The pesto was a little heavy on the salt but was good. We were going to pass on dessert as we were quite full however, the restaurant offered us dessert in celebration of our anniversary. A platter featuring three of their deserts including bread pudding, caramel ice cream cake with caramel pop corn and Sicilian style cannolis. The deserts were all great but I did favour the cannolis, and my wife the ice cream cake. Despite a of couple hiccups Ristorante Beatrice and our server Carlos made our anniversary dinner experience great. I would highly recommend this restaurant if you are in Montréal and looking for real Italian cuisine.